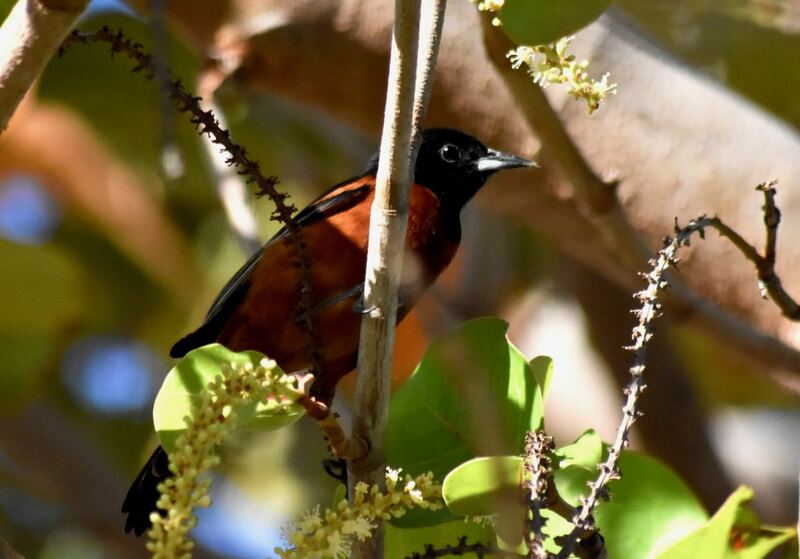 Orchard oriole, photographed at Garden Key, Dry Tortugas National Park, Monroe County, in April 2017. Think oriole and Baltimore immediately pops into mind. There are upwards of three dozen oriole species, but as they might have said back in the day all the others are Avis while the Baltimore is Hertz. Case in point the orchard oriole, Icterus spurius, and the smallest of the oriole genus. The name, spurius, came about because the male of the species was originally identified as a female Baltimore oriole. Orchard orioles are striking birds in their own right. 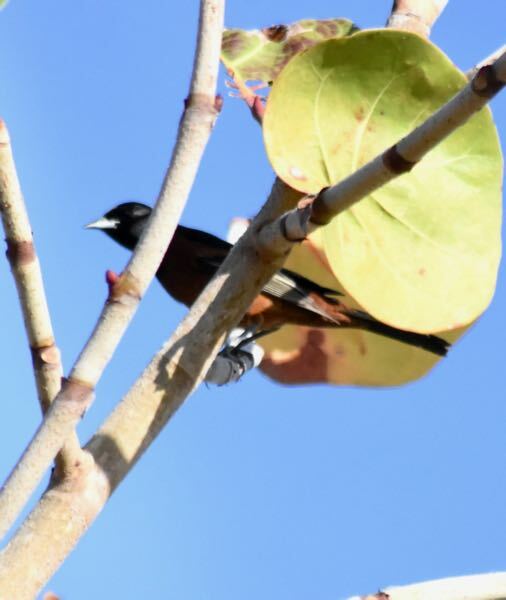 Males have a black face, neck and nape, contrasted with a rich orange breast, dark eyes, black wings with orange shoulders and white striping. They small enough to be confused with a warbler, going about seven inches in length, with a wingspan of about 10 inches. Females are quite different, a drab yellow-gray in the face, breast and tail, with a washed out gray in the wings, with white striping. They are migratory birds who spend summers in the north, winters in the south. They rarely winter over in South Florida, but they do regularly make pit stops here during their spring and fall migrations. Orchard orioles spend the summer breeding season in most of the United States and southern Canada east of the Rockies, including northern Florida (there are a few records of nesting as far south as Osceola County). Come the cold months, they head south to Mexico, Central America and South America, including northern Colombia and northwestern Venezuela. Spring migration is April and May, while the fall extends between August and October. Favorite habitat in summer is open country dotted by a few large trees — live oaks are a favorite. They also prefer places near a lake, river or marsh. Orchard oriole pairs are monogamous, at least for the breeding season. 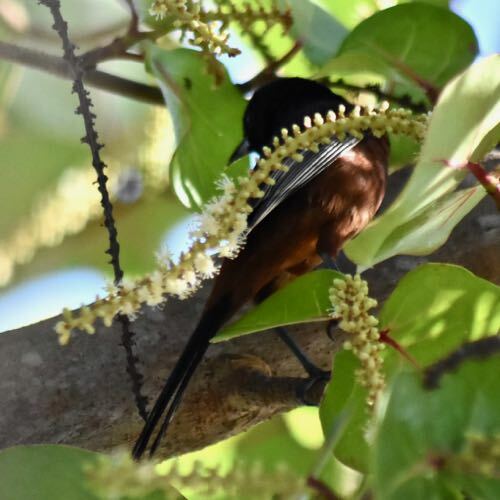 Females construct a hanging cup-shaped nest made of grasses and lined with finer material, including animal hairs, grasses, feathers and anything else that can be scrounged up. They are not highly territorial birds and will nest close to others of their own kind, forming loose colonies, and even other species. Breeding males, however, will defend their turf against younger male intruders. Clutches are usuually three or four eggs, which will require roughly two weeks of incubation, give or take a few days. All sitting duties are handled by the female, while the male feeds her and guards over the nest. Once the eggs hatch, the offspring remain nest-bound for 11 to 14 days, during which time both parents feed them. The fledglings will remain with their parents in the vicinity of the nest for a week before heading off on their own. Orchard orioles rarely attempt a second brood unless the first is unsuccessful. During breeding season, orchard orioles eat mostly insects, but they will eat berries and other small fruit, seeds and nectar. During fall migration, they eat more fruit and nectar; in winter, it's a mix of fruit, nectar and bugs. Orchard orioles are members of Icteridae, the family of black birds and orioles.